Flanked by six F-16 fighter jets, with a fly-over by a B-2 stealth bomber, the latest addition to CareySound's production arsenal-a three over three Phoenix loudspeaker system from Electro-Voice-made a dynamic debut performance in Lakeland, FL at the annual Sun 'n Fun air show. Lakeland, FL's annual Sun 'n Fun air show with ElectroVoice loudspeakers. The weeklong event hosts 160,000 participants, with over 3,000 volunteers and 4,000 aircraft. What the Lakeland, FL chapter of the Experimental Aircraft Association began in 1975 has evolved into one of the premiere air shows in the United States. 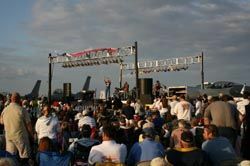 In a first for the air show, a concert featuring pilot, longtime air enthusiast and national country star Aaron Tippin was held at the heart of the flight line and outdoor display aircraft area. CareySound of Greensboro provided the staging, lights, and audio for the concert, and deployed their new Phoenix rig for main PA duty. The Phoenix will make its official Carolina debut at the opening event of the Signal Festival in Chapel Hill on Thursday April 26th, in the Student Union Great Hall on the UNC campus. For more information visit www.boschcommunications.com.